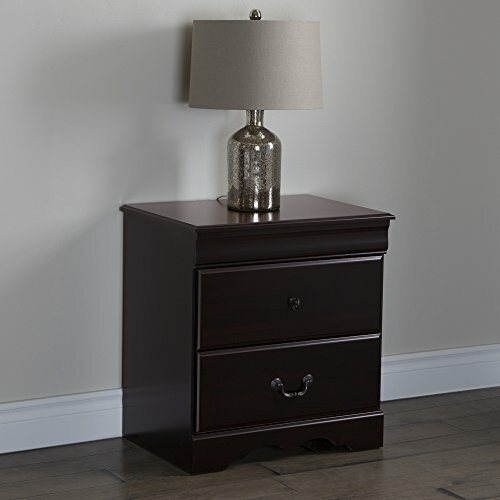 This night stand featuring a profiled top and drawers will definitely add character to your bedroom. A Louis-Philippe style molding embellishes the top of the dresser. Moreover, the stylish kick plate and 2 different but complementary metal handles provide a sophisticated look. 2 types of metal handles in a matte brass finish. Profiled drawer fronts, for a classic touch. For your children’s safety and your own: plastic drawer slides with safety stop and dampers. Drawer #1 dimensions: 19,25" (l) x 14,25" (d) x 4,5" (h). Accessories not included. Requires complete assembly by 2 adults (tools not included). Product dimensions: 24" (l) x 17" (d) x 25" (h). Box dimensions: 29,75" (l) x 18" (d) x 6,75" (h), 43 lbs. This product’s packaging has been tested and is certified to reduce the risk of damage during shipment. Made in Canada with non-toxic laminated particleboard. Clean with a soft dry cloth. 5-Year quality guarantee. Any product-related questions? contact the manufacturer’s customer service, available 7/7 by phone, chat and email. Consult their website for details.